88 Scott St., Toronto. We are pleased to be involved with Concert Properties and Bird Construction on this project. 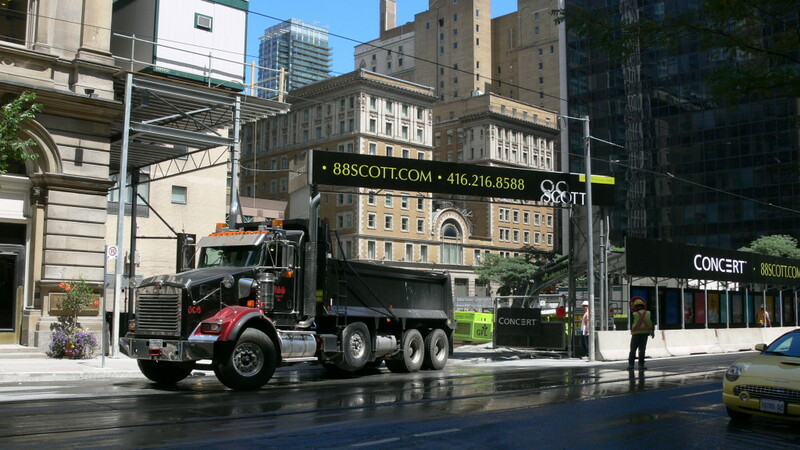 This project is located in downtown Toronto and has a very small footprint to work with. Utilizing our elevated site office we have freed up space on the site. This unique elevation is 20 ft. high and allows adjacent buildings to continue with normal business. We have also elevated the generating station for this project in another area on site. Another challenge is the sites only access point is a very busy street; using our 30 ft. overhead gate protection mounted on a angle has allowed free flow of construction traffic while limiting the disruption of local traffic.